Please note: this book is for students taking the pre-2016 OCR GCE Religious Studies AS and A2 specification. The new book is called Religion and Ethics for OCR: The Complete Resource for the New Specification. The most comprehensive book on the market, Ethics for OCR Religious Studies provides a rigorous and accessible introduction to both historical and contemporary ethical debates, including chapters on sexual and environmental and business ethics. Written with verve and clarity, the books user-friendly style and attention to detail will help students of all abilities to achieve their best. Mark Coffey is a teacher of Religion and Philosophy at The Manchester Grammar School and a regular presenter of The Daily Service on BBC Radio 4. An Oxford theology graduate, he did a Master’s degree by research on Hauerwas at Leeds University under Nigel Biggar. He has written an introduction to the theological ethics of Stanley Hauerwas. Dennis Brown teaches at The Manchester Grammar School where he is Head of one of the largest Religion & Philosophy departments in Britain. He studied theology and philosophy at Edinburgh, New York and Oxford. In addition to writing books and articles on early church history, he has authored A Level textbooks on Religious Studies. His longstanding and particular interest in Ethics has seen him develop courses on legal, medical and business Ethics. He has wide experience of examining, question paper setting and syllabus development. He enjoys challenging young people's assumptions and prejudices. "This is a very thorough and versatile book with plenty in it to satisfy both the diligent student and the demanding teacher. A very welcome addition to the subject area." 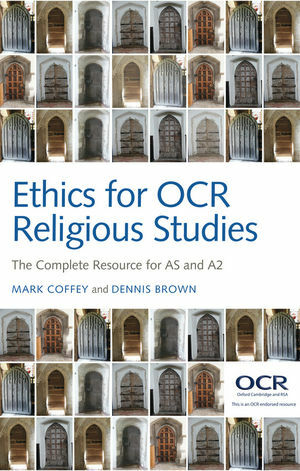 "This is a very comprehensive and substantial resource that would be useful for students of all abilities undertaking the AS and A2 OCR units in Religious Ethics. What sets it apart from those already on the market is the level of research gone into the construction of the content it introduces students to a wider commentary on the issues from a range of diverse and contemporary thinkers. This is a book I would definitely use and recommend to my students." This is just what teachers of Ethics for OCR A Level are looking for: a clear, academic yet accessible guide to every aspect of the OCR specification. It has distinct advantages over others on the market; normative ethical theory is explained clearly, yet with superb academic rigour, enabling students to engage with debates and develop critical thinking skills. This book will stimulate high-level classroom discussion which will stretch and challenge students, helping them to access the highest grades. Moreover, teachers of ethics courses using other specifications will find a great deal in this book which they can use and adapt for their own courses."